Is there a real connection between serial killer Jack the Ripper, author Robert Louis Stevenson, and the “fictional” Dr. Jekyll and Mr. Hyde? Find out in Robert Masello’s The Jekyll Revelation. In "The Taking," Dean Koontz takes readers on an apocalyptic thrill ride that will keep them turning pages late into the night. Our new book club selection is an atmospheric novel filled with horrifying images, relentless suspense and characters that may change the way you see the world. What would you do if on a dark and stormy night, the world as you knew it was claimed by an unfathomable evil? In The Taking, bestselling author Dean Koontz invites you to join him on a thrill ride into Black Lake, a remote California mountain town where Molly and Neil Sloan are about to face their worst nightmare. In the wee hours of the morning, Molly awakens to find that the world has come to an end, not with a wail but with a whimper, and an eerie, luminescent rainfall. As the night progresses, Molly and Neil encounter one amazing phenomenon after another: including a docile pack of coyotes, a talking corpse and the first indications that a new world order is taking shape. In order for the Sloans to survive an Armageddon beyond their wildest nightmares, they must first face their personal demons and, led by a dog named Virgil, rescue the children of the community they love. In so doing, they will encounter a number of jaw-dropping situations, each more dangerous than the last. With The Taking, Koontz uses nail-biting suspense and his trademark wit to write a novel that elevates his already brilliant career to new heights as he takes us on a mind-bending journey where we explore a world filled with unforgettable images, both macabre and beautiful. As the Sloans transcend the world around them, they find meaning in a world that doesn’t stop evolving and leave us with a powerful, socially conscious message we should not soon forget. Reminiscent of his novels Darkfall and Midnight, The Taking is a delightful new addition to a body of work that never fails to entertain and inspire. 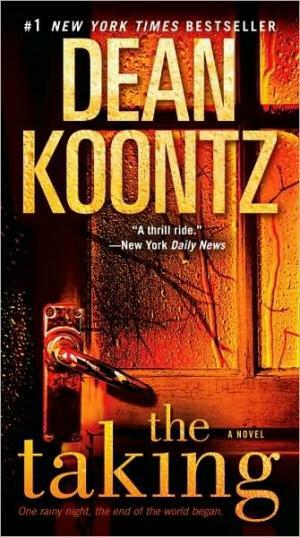 About the author: Dean Koontz is the author of numerous number-one New York Times bestseller. He lives with his wife, Gerda, in Newport Beach, California. Visit his home on the Web at deankoontz.com.